Explore. Relax. Feast. Merrymake. When like-minded friends are added to the mix, a simple road trip adventure takes on a special unfettered charm and an unforgettable energy. Jack Cook and Lois Hoffman, Marathon coach owners from Portland, Oregon; Bill and Lia Halter, Marathon coach owners from Aurora, Oregon; Shelly Ward and Sandy Kincaid, Marathon coach owners from Agua Dulce, California; Dan and Marvel Dement from Molalla, Oregon; Scott and Patty Burlingham from Woodburn, Oregon; and Scott and Shawn Roerig from Aurora, Oregon, are great friends who spend quite a bit of quality time together. 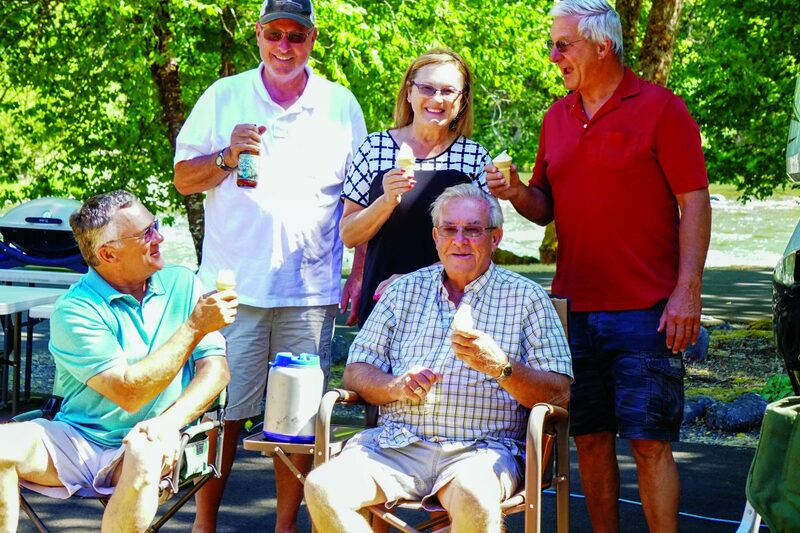 These 12 friends decided to converge at Casey’s Riverside RV Park for a week in the middle of the perfect Oregon summer. 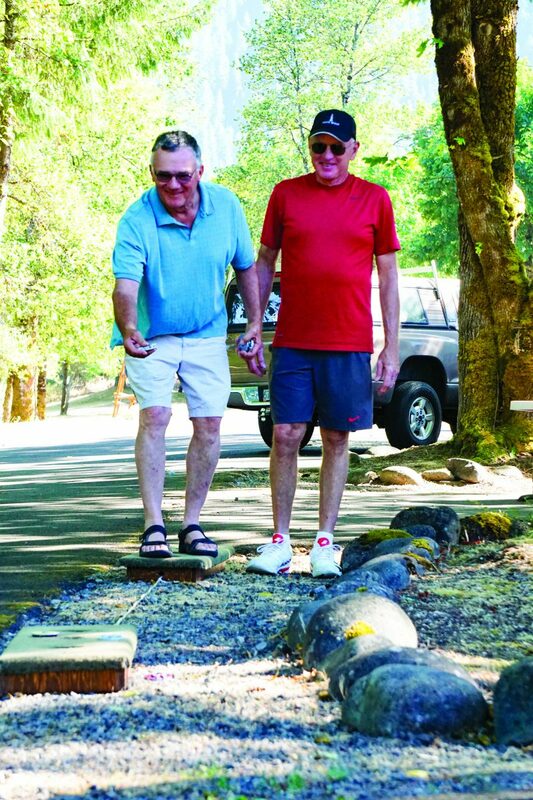 Sitting serenely in Oregon’s Willamette National Forest on the Willamette River, Casey’s is a reprieve from the hustle and bustle of life, and far from the everyday. Things at Casey’s move at a slower, more serene pace. Here, people bask in views of local wildlife, fly fish, kayak, hike and simply breathe. Marvel was the first of the group of adventurers to discover this hidden gem. 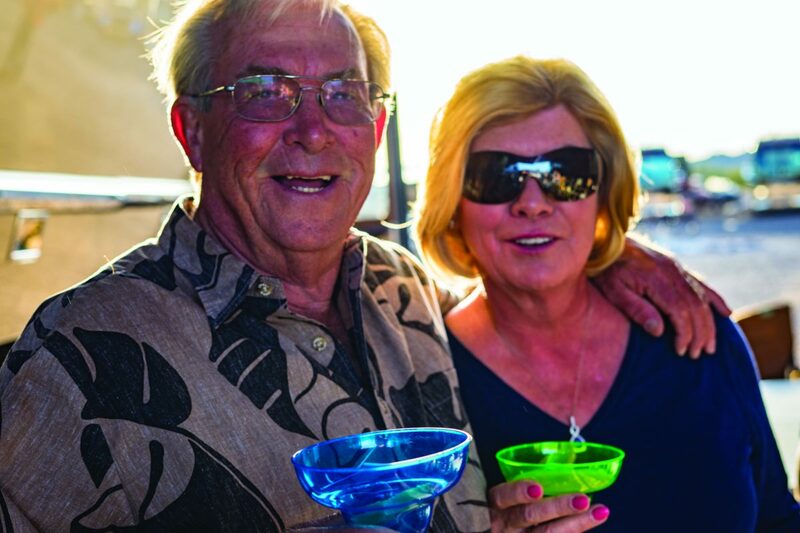 During a stay at Outdoor Resorts Indio (ORI) in Indio, California, she struck up a conversation with her neighbors Bruce and Judy. After a full day of activity with friends going in separate directions, there’s a very relaxed, almost ceremonial, element as the informal happy hour is ushered in. Like a choreographed performance, each person knows exactly what to do. A fresh tablecloth floats down to touch the surface of the buffet table. One camper emerges with a bowl of ice, others exit their coaches with liquor and wine. Someone else comes out with an oversized tray of deviled eggs, while freshly prepared shrimp cocktail and other delicacies quickly – almost as if by magic – find their way to the table. Talk soon shifted to Jack and Lois’s upcoming Super Bowl party. 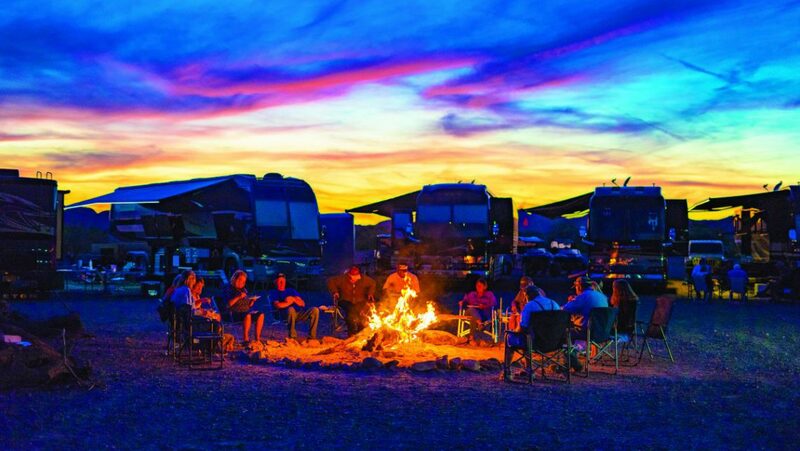 Fourteen or 15 miles up a log road outside Quartzsite, Arizona, this group circle their coaches for the big sporting event, setting up the TVs, preparing the oversized betting boards and making a bonfire so large the faint of heart need not apply. Many guests stay in the desert six or seven weeks. Of course, it about much more than the event itself – it’s about friendship. And it’s about food. “Jack always makes the largest container of chili possible and he serves it up to everyone,” said Marvel. He’s also known for his blueberry pancakes with sausage and bacon on the side, as well as his and Lois’ biscuits and sausage gravy, complete with play-by-play reviews of how much or how little diners are eating. 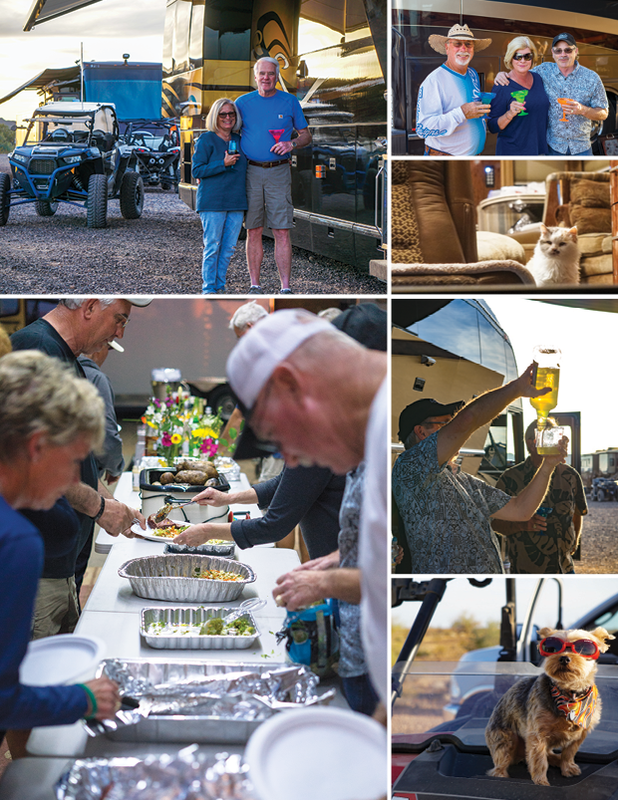 After a day filled with off-road desert racing in buggies built for speed, day turns to night and new friends and old can be seen conversing around the bonfire as someone’s young daughter sends glowing paper lanterns into the sky. Sandy and Shelly, Jack and Lois, Dan and Marvel, and Mark and Sharon Schmidt, Marathon coach owners from Lake Havasu City, Arizona indulged in the ultimate Western adventure, attending the National Finals Rodeo in Las Vegas, the season-ending championship event for the Professional Rodeo Cowboys Association, at the end of 2017. Here they attend concerts, do some cowboy Christmas shopping, horse sales and watch competitions. They’ve been attending for enough years that the children they once watched compete now have children of their own in the competitions. 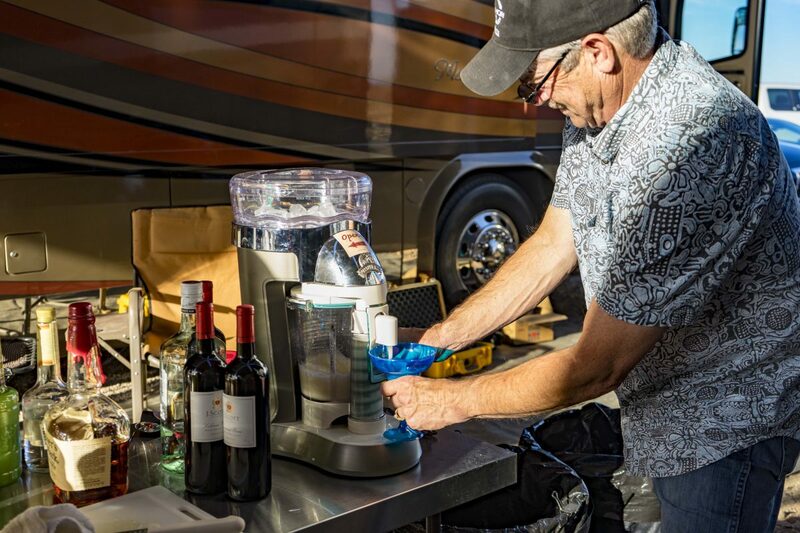 Whether a weekend filled of lassos and horses, a day spent discovering new wineries or a quiet weekend at a pristine campground, with an irrepressible sense of adventure and a palate to match, this group of friends have found their niche when it comes to making the most of their days, honoring friendships and living life to the fullest.